The model was introduced late in 1981 to offer a more affordable guitar with the composite top of the 1687. 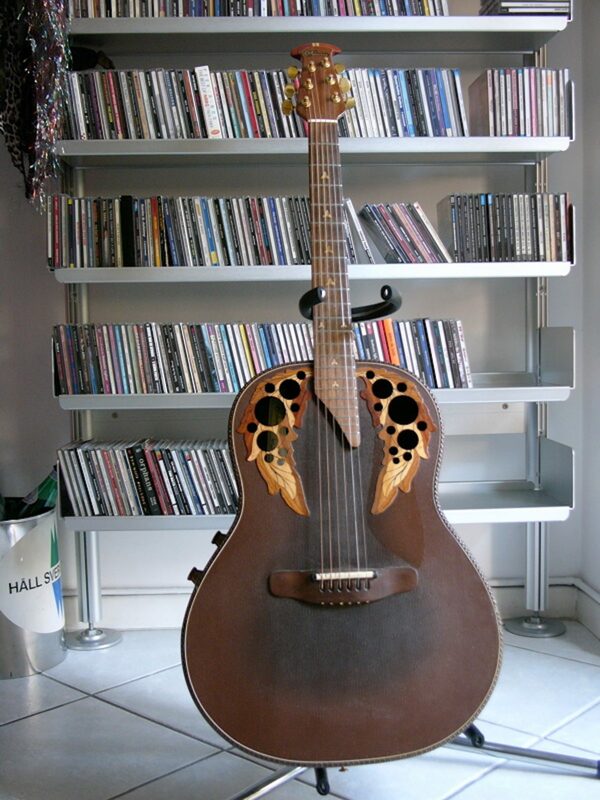 To reduce the price Ovation used a standard 5 piece Ovation neck instead of the one piece American walnut. Also gone is the fancy ornamentation (aka “broccoli”) of bridge and headstock of the original model. But the core of the Adamas guitar, the suspended composite top, is there, resonant and efficient. According to an old thread on the Ovation Fan Club forum, Bill kaman said that the original 1681 Adamas 2 tops were rejected 1687 tops. This might have to do with the frequency response number indicated on the original Adamas labels. Maybe the tops exceeding a certain range considered optimal were used for the A2 that did not come with the frequency response measurement. Who knows? This 1983 guitar still has the original Adamas stereo electronics. It’s very well used, but in wonderful condition despite its age. I bought it in 2001 from an Italian guitar collector after a long discussion on the price (but hey, that is part of the fun). The guitar has been played, so the board is elastic and responding, it vibrates well and resonates wonderfully. Well balanced in the voice and easy to play, thanks to a perfect neck. It’s one of my favourite Ovations, when I pick it up I feel at home. I am tempted to say that this might be my best sounding guitar, but don’t trust me, I change my mind often… The original brown case is in nice condition, too. Thank you Igor!